I don't really like to do this type of post normally because even though I have been at this a while now, I wouldn't ever consider myself an expert of any kind, but I do often get asked what products I use so I thought it was about time to put up a post detailing my own personal dos and don'ts. If you have anything specific that really helps you that I don't mention, let me know. This post is very long, so strap in and get ready to read a lot. So my first tip is to make sure you have good quality tools and to start with, I'm talking nail clippers and scissors. When taking off a good bit of length, I much prefer to cut them down so that you only file a little bit. When cutting, use multiple cuts instead of trying to cut the nail in one and make sure you are using decent, sharp clippers. Cheap nail clippers can pull at, and rip the nail. 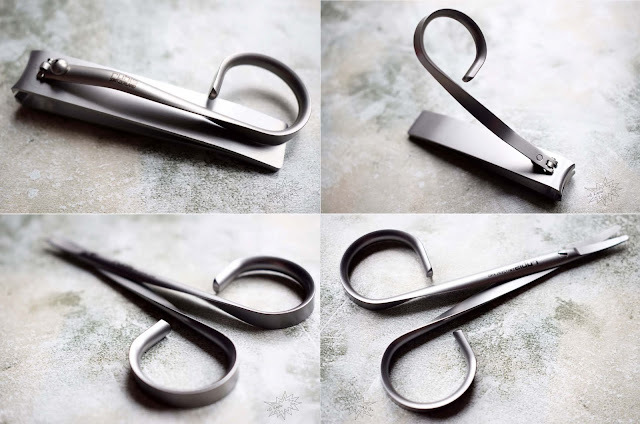 I was sent these beautiful Rubis nail tools by the lovely Danielle over at SparklePR. 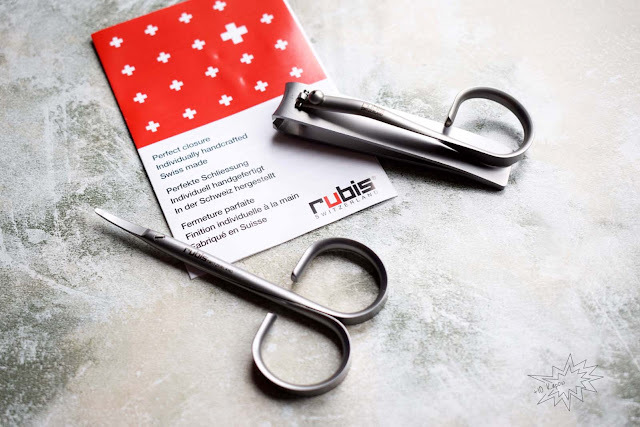 Rubis are a swiss company making nails tools and tweezers for professionals and the discerning home user. These are pretty fab! They have a unique design, are very comfortable to use and they are fantastic quality. Confession time! Me and Jim have had the same pair of nail clippers for almost a decade! (don't worry, we clean them, stop judging us hahaha) They are incredibly well made and they cut easily through Jim's super thick toe nails, we have bought many new clippers over the years but none of them have been as good as this old pair. Until now! These Rubis clippers are definitely going to replace that old pair. I highly recommend checking out the Rubis website! These cost £23.50 for the scissors and £28.50 for the clippers, which may seem like a lot but think about how often you use these items, how many people are in your household and how long you will keep them, it's definitely an investment! Staying on the subject of good quality tools, let's talk about nail files. 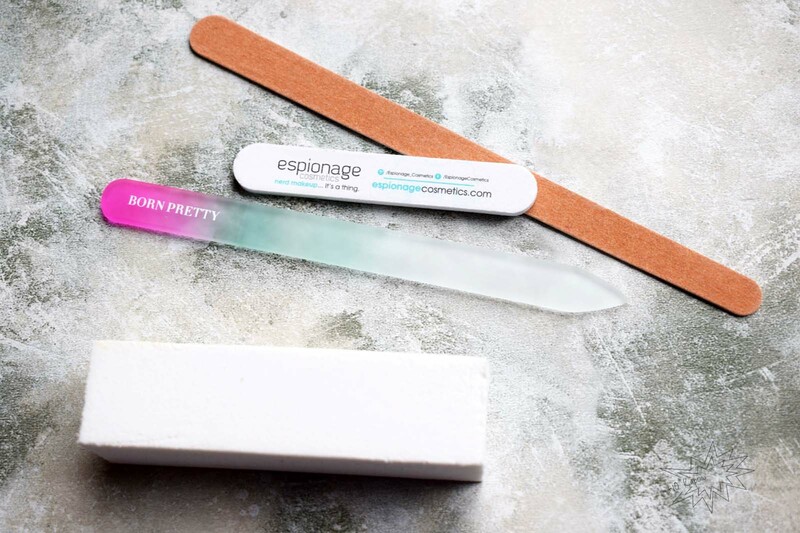 Glass nail files are better for your nails than standard emery board. You see, when looking for a good nail file, the finer the grit the better, they cause less damage and can even help reduce chipping and peeling. Plus, you can wash glass nail files, getting rid of any bacteria that may have been transferred to it. Not to mention that, as long as you look after these, they can last for ages, years even, compared to the very short life of an emery board. But keep emery boards around because they work perfectly with nail wraps. I use this glass file from Born Pretty at the moment and it's pretty good. When filing, always file in a single direction. If you saw the nail back and forth you will almost definitely weaken the nails. From my experience, I recommend making the open end of the nail slightly narrower, I favour the coffin or ballerina shape now and this is because it reduces the amount of corner snaps I get. 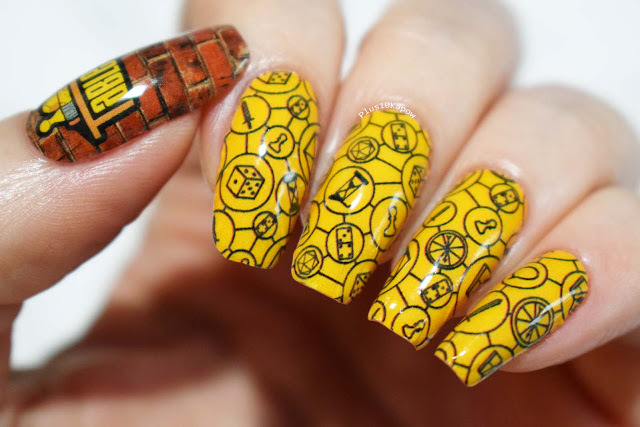 Aim to file your nails a little about once a weak. And if you do get a break, file immediately so as not to extend the tear any further or do more damage. DON'T use metal nail files on your natural nails, EVER! NEVER file your nail when it is wet! Filing when wet can cause tears to the layers of your nail. Now on to the buffer! Buffer bars can be a good addition to your manicure kit, especially if you experience a bit of peeling because you can buff out the bit that has peeled or snagged to prevent it from extending across the nail. But, buff gently, as you are essentially sanding away layers of the nail and the more you do, the more you weaken your nail! I only ever buff my nails when they have damage that could get worse if not buffed away or once a month I lightly buff over every nails to keep them smooth and in shape. Cuticle care is essential when trying to grow your nails. You need to take super good care of the whole area surrounding the nail. So I recommend having a really good hand cream in your daily routine, especially if you use hand sanitiser a lot like I do. I use Carex Bubblegum or Love Hearts hand gel which I buy from Superdrug, gotta keep the germs away. First of all, and let me make this clear DON'T CUT YOUR CUTICLES! They are there to protect your nails from bacteria and infection and if you cut them, you leave them open to infection. If you get your nails done at a salon, make it clear to your technician that you don't want your cuticles cut, ask them to just push them back, then trim away any hang nails or loose skin. Not to mention, cutting the cuticles is purely cosmetic and doesn't offer any benefits to the nail at all. 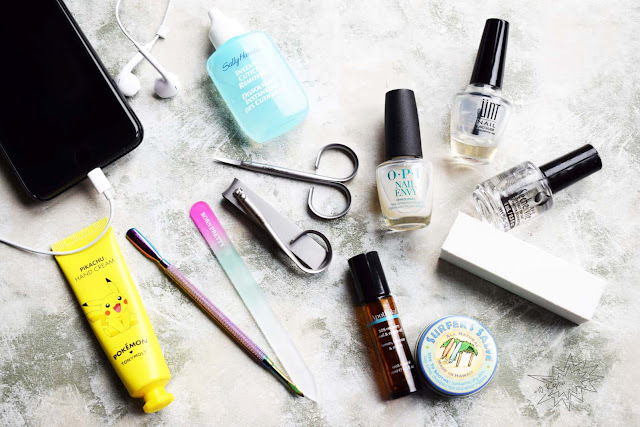 Find a good cuticle oil that works for you! Not everybody will get on with the same thing and what works for me, may not work for you. 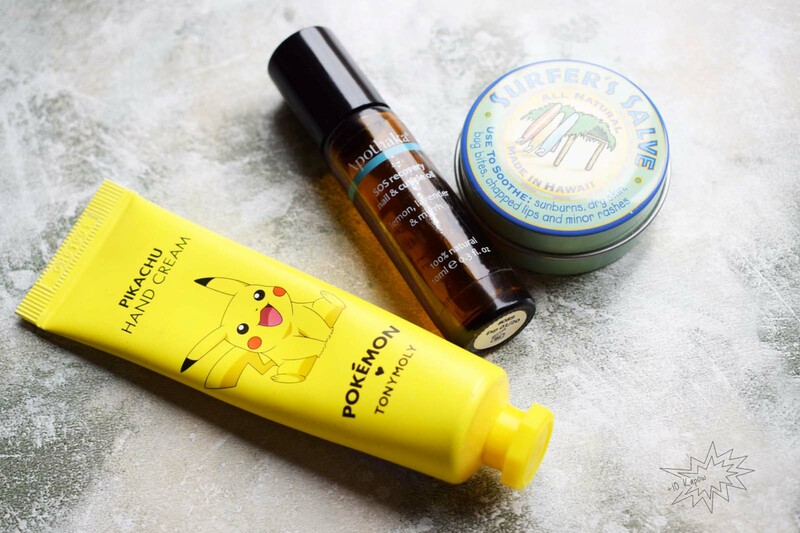 And if you don't get on with oil, you could always swap this out with cuticle butter, cuticle cream or cuticle balm. Or, even better, use a combination of some or all of them. Use whatever option you go for, multiple times a day! If you keep forgetting to do it, set reminders on your phone. And anytime you have had your hands in water, whack a load of it on. Water can cause peeling and can make the nails brittle and prone to snapping so you need to get that oil on straight away. You know those moments when you're walking past something and your arm flails out violently, smashing your hand into the washing machine or fridge, and you get that gasp moment as you check if your nail is broken, then you see the massive snap! Just me? OK! Oil can help prevent that. Once you have been using it long enough and frequently enough, your nails will bend instead of breaking with most of these incidents. It'll hurt like hell, but your nail will still be in tact, and this is what we are working towards with our moisture campaign. As you can see, I use the Apothaka SOS Recovery Nail & Cuticle Oil and I absolutely love it and credit my ability to even grow long nails to it. 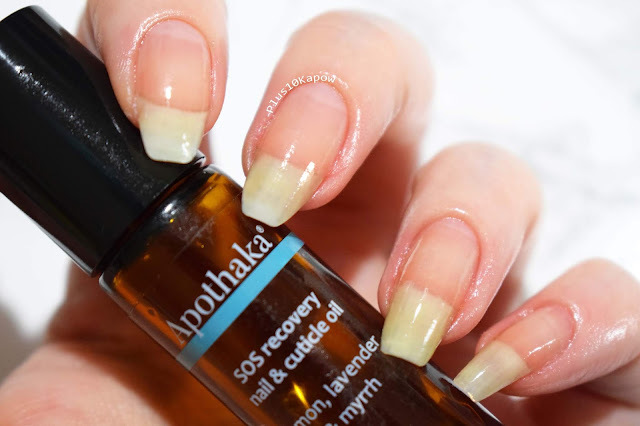 With all natural ingredients and essential oils, the SOS Recovery Nail & Cuticle Oil moisturises and restores flexibility to your nails, encouraging growth and reducing nail breaks. It comes in a UV filtered, glass rollerball which is super convenient and feels really fancy, plus recyclable ftw. It is on the slightly pricier side but I use mine multiple times a day and it lasts me at least a month, it definitely goes a long way and ends up being well worth the price, not to mention the fact that the product is amazing. 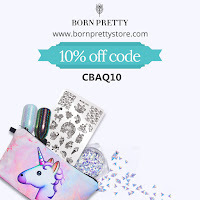 A few times a week, when I have used cuticle oil, I gently push back my cuticles, there are many different tools you can use for this but my favourite is this pusher from Born Pretty Store. Pushing cuticles back keeps them looking neat and tidy and will make your manis look better. Once a month, I also use Sally Hansen Instant Cuticle Remover. This has been one of my favourite products throughout my blogging years. It melts away and breaks down any excess/overgrown cuticles and helps keep your cuticles smooth and soft. It can also help soften calluses on your hand too. ALWAYS! ALWAYS! Use a base coat. Even if you don't have a full manicure on, whack on a few coats of your favourite base coat, especially if it is repairing or strengthening. 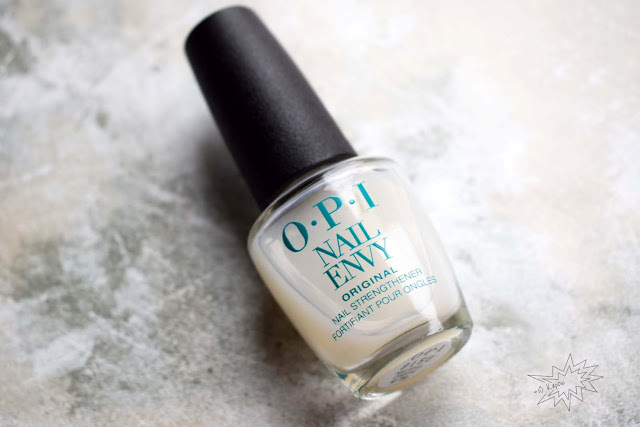 My base coat of choice is OPI Nail Envy and has been for years. When anyone asks me how I grow my nails long my answer is always "A good cuticle oil and great, strengthening base coat like Nail Envy"
There are quite a few different types of Nail Envy, there is even one for those with persistent peeling, but although I have tried a few of the different types, my favourite is still Original. Plus, it dries really quickly too. I also recently got on board with the peel off base coat thing and am now completely in love with UNT Ready for Take Off peel off base coat. 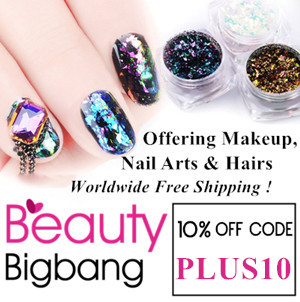 This type of base coat is great for glitter manis or if you are in a swatching marathon, it means that you are scrubbing at your nails with polish remover and you aren't drying out your nails and surrounding skin with acetone. Another thing I would recommend is to always finish your mani's with a good, solid topcoat. My topcoat of choice is Seche Vite. Not only does it make your mani look glossy and make any glitters and holos look amazing, but it adds strength to your nails. 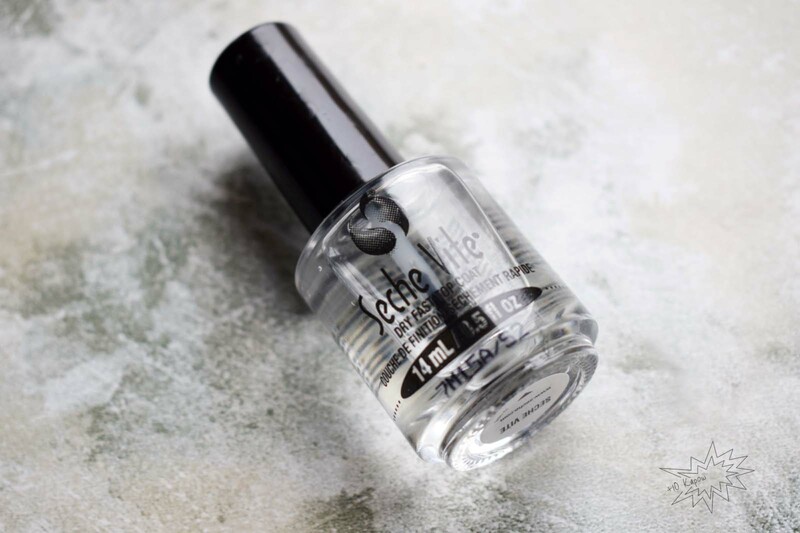 Seche Vite is a quick dry topcoat, so it won't always be the best choice, especially not with water decals or nail wraps, but when you can add it, add it. 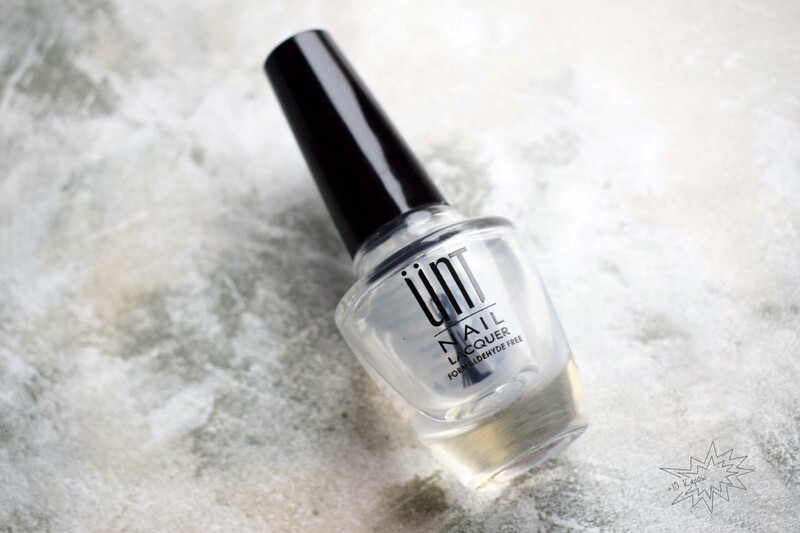 If you want a matte mani, add Seche Vite first, then when it is dry, add a coat of your favourite matte topcoat. For other manis, like ones with water decals, I use Barry M Plumpy. Whether you are cleaning, washing the dishes or giving the dog a bath, have rubber gloves on. The chemicals and prolonged water contact are a sure-fire way to weaken and damage your nails. So unless you are having a bath or shower, keep your nails covered. And when you take off the gloves, oil and moisturise just in case. Keep your nails a good length for you! If you are constantly knocking your nails then a shorter length may be best for you. If you have a manual labour job, then you already know that short is best but you can still make short nails look amazing. And if, like me, you don't or can't do much activity then you can go long. Most of my breaks come from falls these days and there is no avoiding them for me but I won't let that stop me growing them as much as I can. I am also one of those people that when my nails are long, I want them short, and when they are short, I want them long. I am never satisfied but I am glad I have the option and ability to grow them easily and well now. Do not bite your nails. Not only is it damaging to your nails, but it's gross. No matter how much you wash your hands there will always be bacteria under them and you are putting that in your mouth which can linger and give you halitosis. You also risk paronychia, an infection of the nail and if you bite one nail that has this, then bit other nails, you risk spreading the infection. Do not use your nails to open things. Ok, so I am guilty of doing this too, especially when my nails are short but I also cringe when I see other people doing it. This also applies to picking stickers off. Super chipped polish. I know people get super busy sometimes and don't have time to redo or get their nails done but at least take the time to take the polish off. This is a personal one and may not bug other people as much as it bugs me. Do not get acrylic nails. Again, this is mostly a personal one, I know some of you absolutely rock these but constant use of acrylic nails can weaken your natural nails and cause ridges making your nail plate bumpy and your whole nail brittle and parched. I experienced this type of damage with my friends nails and it took us around 6 months to get her nails back into a decent condition. Chalkboard scratching *shudders* NO! JUST NO! So if you stuck through this incredibly lengthy post and got to this point, kudos to you! I linked to all the products I use and where I actually buy them from if you want to give them a try, let me know if you do. I hope you gained something from this post, even if it is just what I use to keep my nails healthy. If you have something different that works for you, let me know in the comments. Keep nailing it! *some items in this post were gifted to me. All opinions expressed are my own honest opinion.